Starting your biz on a limited budget? Need to expand without spending a fortune? 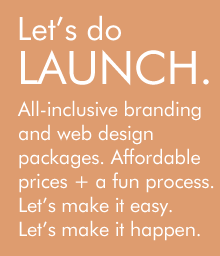 Our Launch Packages give you everything you need to launch your online business, market your talents and spread the word to clients. Choose from three affordable options that will help you start, grow or take your ideas big-time.